Prosecutors, judges and criminal defense attorneys must accurately calculate and advise defendants on possible sentencing consequences of a plea to criminal charges. 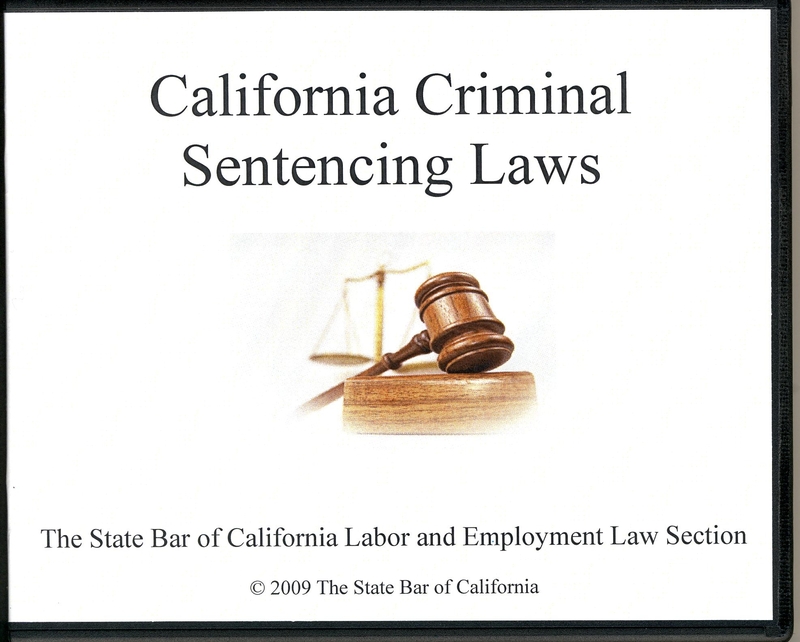 This Panel will navigate the California determinate and indeterminate sentencing laws. Recorded September 2009. May is National Mediation Month. Check out the mediation materials on display in the Library. 3. To effect or convey as an intermediate agent or mechanism. Verb. 1. To intervene between two or more disputants in order to bring about an agreement, a settlement, or a compromise. 2. To settle or reconcile differences. 3. To have a relation to two differing persons or things. Adjective. The activity of mediation in itself appeared in very ancient times. Historians presume early cases in Phoenician commerce (but suppose its use in Babylon, too). The practice developed in Ancient Greece (which knew the non-marital mediator as a proxenetas), then in Roman civilization, (Roman law (starting from Justinian’s Digest of 530 – 533 CE) recognized mediation. The Romans called mediators by a variety of names, including internuncius, medium, intercessor, philantropus, interpolator, conciliator, interlocutor, interpres, and finally mediator. The Middle Ages regarded mediation differently, sometimes forbidding the practice or restricting its use to centralized authorities. Some cultures regarded the mediator as a sacred figure, worthy of particular respect; and the role partly overlapped with that of traditional wise men or tribal chief. Mediation, in the modern legal sense, is a form of alternative dispute resolution (ADR) or “appropriate dispute resolution”, aiming to assist two (or more) disputants in reaching an agreement. The parties themselves determine the conditions of any settlements reached – rather than accepting something imposed by a third party. The disputes may involve (as parties) states, organizations, communities, individuals or other representatives with a vested interest in the outcome. Mediators use appropriate techniques and/or skills to open and/or improve dialogue between disputants, aiming to help the parties reach an agreement (with concrete effects) on the disputed matter. Normally, all parties must view the mediator as impartial. Disputants may use mediation in a variety of disputes, such as commercial, legal, diplomatic, workplace, community and family matters. A third-party representative may contract and mediate between (say) unions and corporations. When a workers’ union goes on strike, a dispute takes place, and the corporation hires a third party to intervene in attempt to settle a contract or agreement between the union and the corporation. Mediation offers a process by which two parties work towards an agreement with the aid of a neutral third party. Litigation, however, is a process in which the courts impose binding decisions on the disputing parties in a determinative process operating at the level of legal rights and obligations. These two processes sound completely different, but both are a form of dispute resolution. Litigation is conventionally used and conventionally accepted, but Mediation is slowly becoming more recognized as a successful tool in dispute resolution. Slowly these processes are becoming inter-dependent, as the Courts in some cases are now referring parties to Mediation. In saying this, there are distinct differences between the two processes. Mediation claims to resolve many of the problems associated with litigation, such as the high costs involved, the formality of the court system and the complexity of the court process. Mediation does not create binding agreements unless the parties consent to it, and the Mediator has no say in the outcome. Even though our court system and mediation have increasing connections, they still reflect different value assumptions and structural approaches towards dispute resolution. In the field of resolving legal controversies, mediation offers an informal method of dispute resolution, in which a neutral third party, the mediator, attempts to assist the parties in finding resolution to their problem through the mediation process. Although mediation has no legal standing per se, the parties can (usually with assistance from legal counsel) commit agreed points to writing and sign this document, thus producing a legally binding contract in some jurisdiction specified therein. Mediation differs from most other conflict resolution processes by virtue of its simplicity, and in the clarity of its rules. It is employed at all scales from petty civil disputes to global peace talks. It is thus difficult to characterize it independently of these scales or specific jurisdictions – where ‘Mediation’ may in fact be formally defined and may in fact require specific licenses.